Heat oven to 350°F. In large bowl, break up cookie dough. Stir or knead in chopped peanuts and flour until well blended. Work with half of dough at a time; refrigerate remaining dough until needed. Place sugar in shallow dish. For each cookie, shape dough into 1-inch ball, then shape ball into 1 1/2-inch-long egg shape. Roll in sugar to coat. Place cookies 2 inches apart on ungreased cookie sheets. Repeat with remaining dough. Bake 8 to 11 minutes or until light golden brown. Cool 1 minute; remove from cookie sheets. Immediately insert string candy piece in 1 end of each cookie for tail. Cool completely, about 15 minutes. On each cookie, use decorating gel to attach 2 cinnamon candies for eyes and 1 chocolate chip for nose. 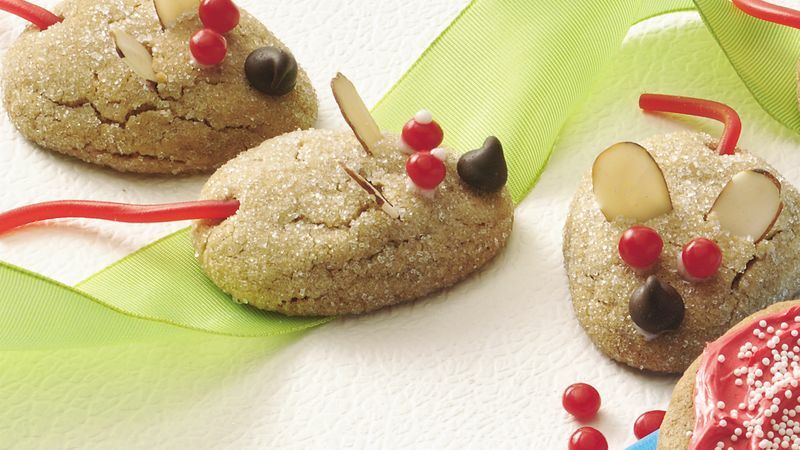 With sharp knife, make 2 small slits in each cookie above eyes; insert almond slices for ears. Store in tightly covered container. If desired, purchase white decorator icing in an aerosol can instead of the tube decorating gel to attach the eyes. Store these cookies loosely covered.